We were up at 5:00 and finished our hot breakfast by 6. As we were finishing packing, Don motioned for me to quietly come and take a look at the Roosevelt Elk who was enjoying the peaceful morning. After taking several photos, we realized that he did not care that we were there and he was just going to do his thing. Finally we decided that it was time for us to move on. He stood in the trail as we took more photos and then just put his head down to continue eating. Tomorrow is the start date for bow hunting season. This guy doesn't have a chance for survival if he isn't a little more cautious. We are hiking thru prime elk terrain. Wide open meadows with plenty of water seems to be everywhere. Had some beautiful views of Mt. Rainer. Trail today was back to steep ups and downs. There also was the challenge of it being quite hot! Met an interesting character at Anderson Lake, where we stopped to have lunch. He was camping with his dog who was being frustrated trying to carry a large stick. He was also wearing a gun.The day is now hotter and the trail up. Water never tasted so good. We hike a bit with Topper again who is getting picked up at the next roadhead by a vet. He will then bring her back the next day. At the road there is a beautiful wooden bridge that is used by PCT hikers. It is the entrance for Mount Ranier National Park. 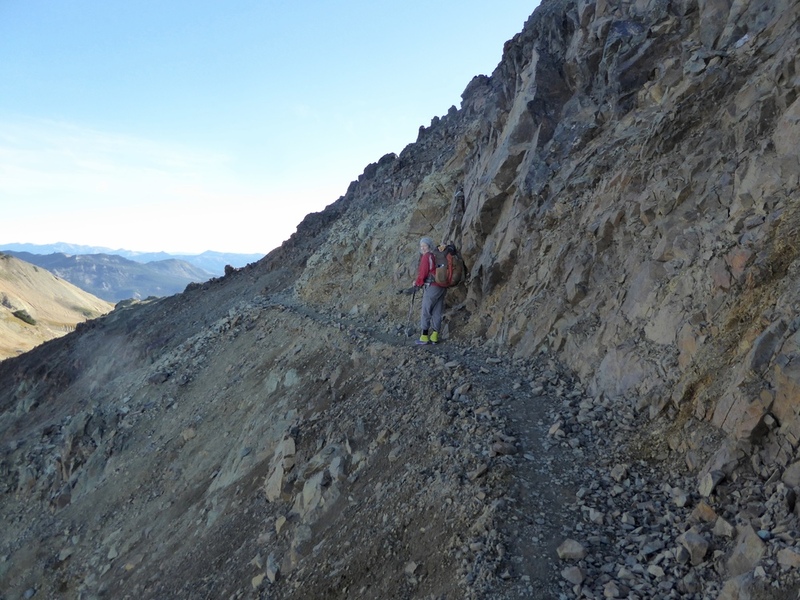 We meet Banker Jim, a retired banker, who hikes short sections and as he says he is banking miles. Someday he plans to hike the trail in its entirety. Sheep lake is home for tonight. As it is the weekend and not far from a trailhead, there are a number of tents. Up at 5:30 and soon on the trail. 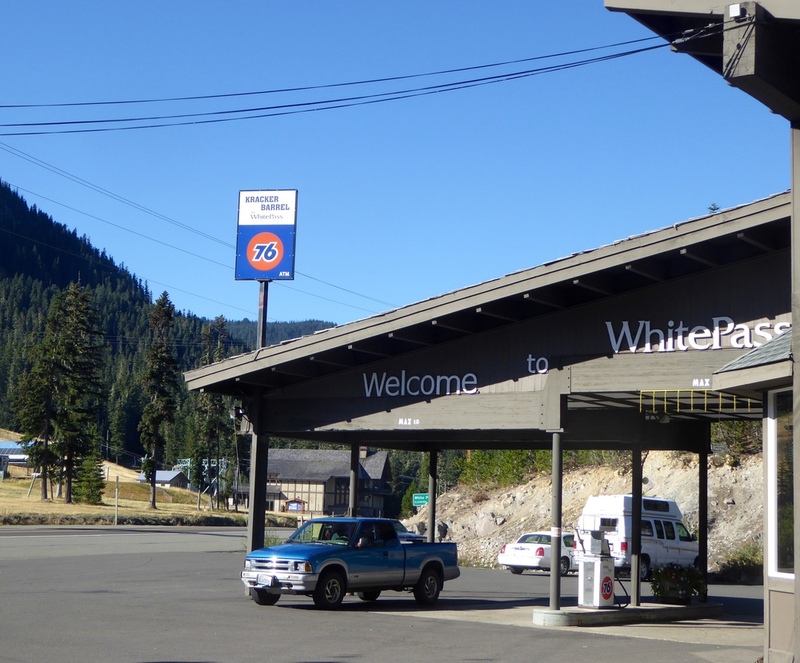 Breakfast is going to be at White Pass. A gentle downhill leads us to the highway and a short walk to our left brings us to the Kracker Barrel Store. Simba had just gotten his resupply and told us where to get water. It is always a relief to have boxes in hand. So far our food is working out well. Just a little extra with plenty to satisfy our needs. We were able to recharge the Steri pen here. Not Yet is leaving the trail and Switchfoot and Siren are spending a day with Siren’s relatives. We say our goodbyes, but imagine that we will see them again. We meet Firecracker who shared our site last night. She is from Denmark and has been traveling off and on with Simba. A beautiful sunny day, has us wanting to do some laundry and body washing. As we are waiting for our clothes to dry we read more of the Martian. The trail is gentle as it weaves between many of the lakes in the area. Hunting season has brought out several groups of horse packers. Our bodies are beginning to adjust to the daily hike which is a relief. Met Topper today who is sponsored by a non profit for veterans. She is the only one left of the group that started with 6 veterans. Snow Lake looked like a good place to call home for the night. Even though there are quite a few thru hikers on the trail, camping does not seem to be a problem. It was an enjoyable evening sitting at the Lake’s edge watching 5 ducks hunting for food on the lake. To bed early and enjoying the quiet. It was a warm night with the stars twinkling. We got up about 5 to cook a hot breakfast in preparation for the hike over Goat Rocks today. We were on our way by about 6:10, passing several tents along the way. As we neared the ridgeline we had to cross a slippery icy snow field. Two people that were crossing it seemed to be having difficulty so we took a higher route thru the borders which seemed to work fine. The trail and views could not have been better. We had heard horror stories of this section when the weather is bad. Glad we did not have to experience that. This was a day of going up 1000 feet and then down a 1000 feet, then up another 1000 feet and back down 1000 feet. Not an easy trail for sore appendages. Lutz lake provided us much needed water. Sometimes it seems hard to think that we are in WA when we have long stretches with no water. As we approached White Pass we came across the first ski area. Signs and chairlifts made it obvious. Last year, due to lack of snow, several of these areas never opened. We had planned on camping at Gilote Lake and arrived there near evening. Several groups of elk hunters passed us today.We were in our tent when we heard another hiker come by. She introduced herself as Firecracker and said that she had seen numerous eyes in the dark and kept hiking till she had found some other campers. She did not feel safe camping by herself. We had heard Elk in the area so assumed that she had seen their eyes with her headlamp. As we see more thru hikers the norm seems to be group camping. Hikers usually do not hike in groups but have a predetermined camp for the night. Switchfoot, Siren and Not Yet passed us late afternoon. They were going to camp at a campground near White Pass, The good news is that the trail is now opened all the way to Canada. With all the rain that we have been having it is unlikely that the trail will be closed again. We started a new activity last night. We are taking turns reading the Martian. Looking forward to reading about all of his challenges and how he overcomes them. I also read a section from one of John Muir’s books. He wrote that his life in God’s wilderness has blessed him so much and when he dies if heaven is not what he believes that is okay as he has been blessed here. We were up around 5:15 and on the trail by 6:20.The skies are clear and the day is warm. We ate a bar and then hiked to a small pond where we had breakfast around 9. Lunch was at Sheep Lake where we talked to a hiker that had been out for the week. 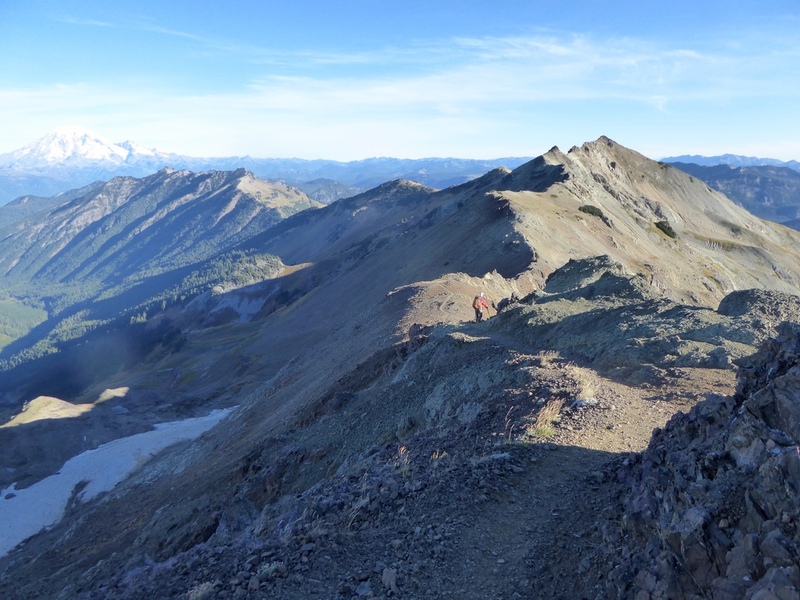 He said that Goat Rocks was difficult and he recommended going over the area in the morning. That sounded good to us. It was hot on some parts of the trail today. We had great views of Mt. Adams and Mt. 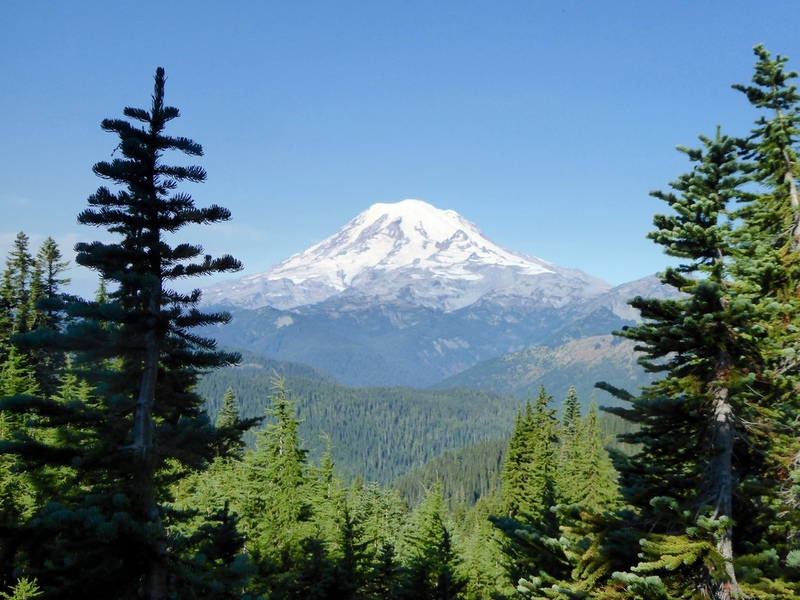 Rainer, We went over the pass and opted for a great campsite with a 360 degree view. There were over 50 Mountain Goats eating and playing in our view tonight. Switch foot and Not Yet passed our camp about 6:30. There was a little smoke in the air tonight. Decided to take some Ibu this morning. I am moving a little faster, Don is moving a little slower. At a logging road we were able to call to Jeff and ask him for some needed items.This is our only supported resupply. The rest will be in small towns. We made it to the road at about 9:00. The sun was shining so we took this opportunity to dry out our damp gear, A large sign on the other side of the road said Trail closed. There were only rumors of when it might be opened so we opted to have Jeff drive around the closed 22 mile section. There were trail angels that were driving hikers to the next trailhead. Some though had opted to walk the 22 miles of paved and gravel roads. Two of them, were Switchfoot and Not Yet. We also met Siren who had skipped Oregon due to an injury and was hiking WA before returning to finish in Oregon. Jeff arrived with all the asked for goodies and more. Thankfully he agreed that he would take us around the closed section. The drive was about 24 miles, but it was quite slow going with washboard and narrow stretches. It took us over 2 hours. We passed several of the road walkers, wished them well and secretly were glad to be in the car. Jeff dropped us off and began the drive back to Beaverton. When we talked to him that night he told us that he had picked up several hikers on his return. The ecosystem is different now. We are higher up and out of the large trees. Not wanting to hike far today, taking a nero (near zero day) seemed appropriate. After a short 3 mile jaunt,. we found a pond and a nice flat campsite. The fall colors were reflected by the water of the pond. It was a relaxed afternoon consisting of napping and map reading. About 7 thru hikers passed our camp today. A meal that Jeff and Carolina made for us in SanDiego was oh so good. 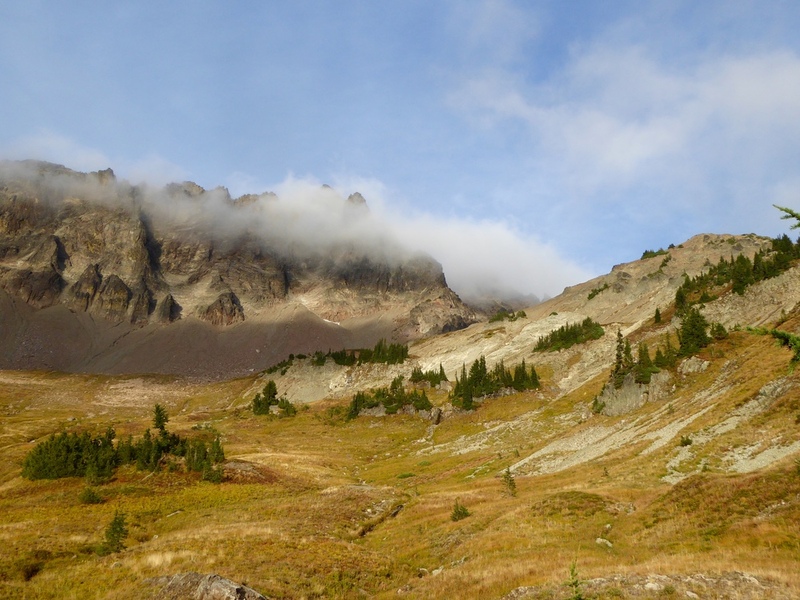 Tomorrow we want to make it over Ciprus Pass which should put us hiking over Goat Rocks in good weather. Ryan made it back to San Diego with his sailboat. He had some work done in Ensenada. Always nice to know when the kids are back safely. The rain stopped long enough for us to take down our very wet fly and the tent body was only damp. A hot drink and left over lentils sent us on up the trail We passed Switchfoot and Not Yet still asleep. 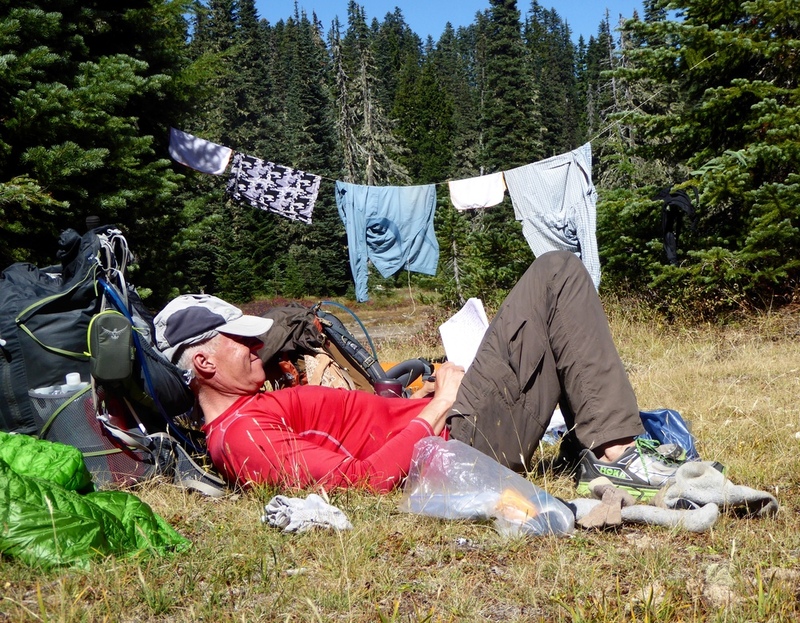 We are beginning to realize that most of the thru hikers sleep in and hike fast. We on the other hand are like turtles and just plod along. Lots of ups and downs. When the rain started we quickly put on the rain gear. (Mine almost immediately split in the crotch. ) We learned our lesson yesterday. Lots of clouds and fog today prohibited good viewing of the area. At a marked spring we stopped to cook up a hot breakfast. Two south bounders who had flipped (went from CA to northern WA and are now heading south) were also getting water. They said that they had met over 30 thru hikers yesterday heading North. We are on the train of hikers heading Northbound. Our sore bodies did not feel too bad in the morning, but by late afternoon the symptoms were back. We were looking forward to camping at Blue Lake. The weather was nasty and even though it was Labor Day Weekend, we figured that there would be space there. WRONG! Camping was in designated spots and as a friendly lady greeted us she told us that her group had gotten the last one. Now we were not only wet, but the wind was also blowing hard. Not wanting to have an epic evening, we hiked a little further and found a spot. Not sure if we were out of the designated camping area but safety of the individual took priority. The rain was dumping so we made the decision to sleep with the food in the tent and fend off any pesky critters. The one we feared most was the chipmunk. Considering it was a full campground on Labor Day Weekend, the weather made for most if not all the groups having a quiet tent bound night. The sun woke us up. Sleep is a good thing! It is quite dry in this state. 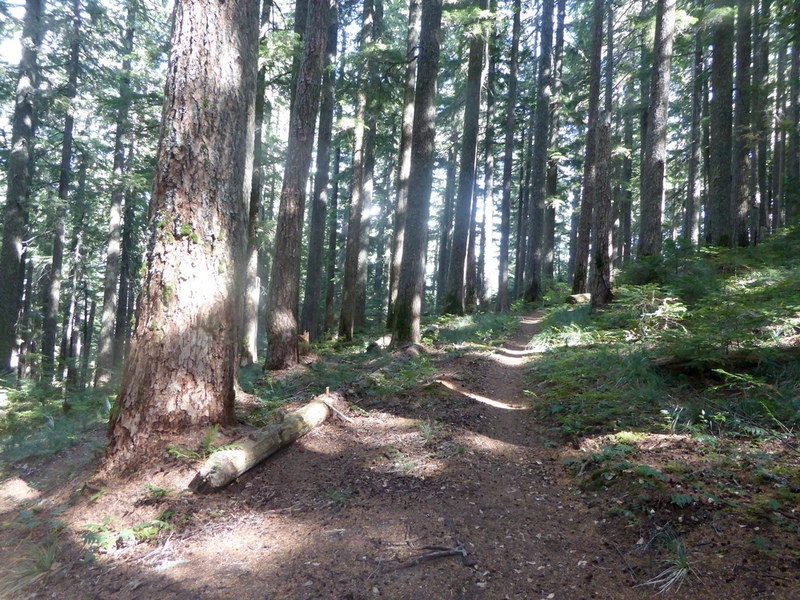 In fact many sections of the PCT in WA are closed due to fires. We are hoping that as we head North the sections will be reopened. Nothing we can do about the fire situation and the trails are opened where we are going now, so up go the packs. We hiked down to Rock Creek and had breakfast under the wooden bridge. If it had been warmer,a refreshing pool looked inviting, but not this early in the morning. The first person we saw on the trail was running towards us. She was a trail organizer for a 50K that is going to be run tomorrow. She marked the trail with ribbons and a white powder, probably baking soda to point out some interesting landmarks. Fortunately we will not be on this section tomorrow. It would slow us down even more. We are carrying more water than we need to, as there seems to be more water than is marked in the data book. Our map reading continues to be lacking. WA does not do a great job of naming creeks and we once again put us ahead of where we really were. When the trail didn't start a serious up hill we had to reassess our position. 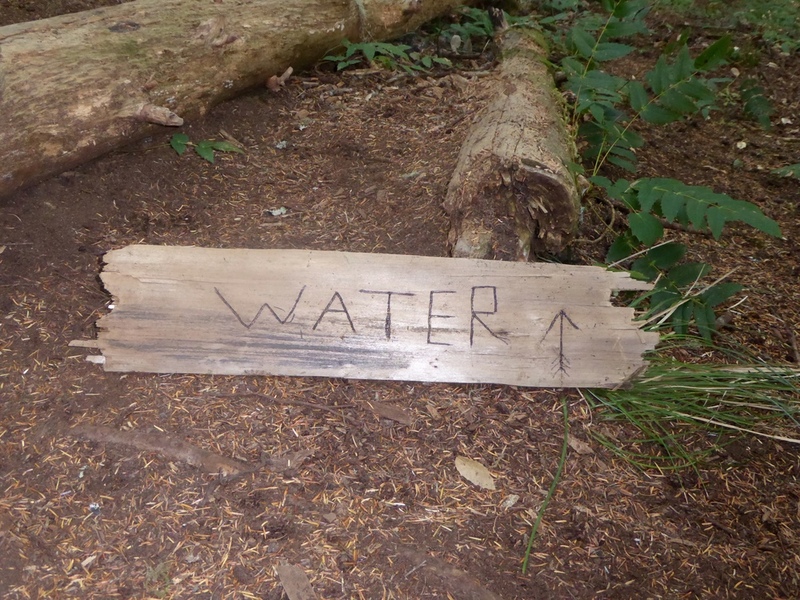 Our moral was a bit dampened at that point, so when we saw a cooler marked trail magic our spirits got uplifted. The cooler was full of fruits and drinks. Even though we were only on day two, the crisp Granny Apple tasted good. Now we knew our location as the trail and map agreed. It was time to start the uphill. First came the rain and as the trail became steeper and higher the rain turned to hail. Lots of Hail!! Our umbrellas helped and we made slow but steady process up hill. At this point some of our slowness was due to Don’s painful feet and Donna’s painful knee. We began looking for a flat spot, but there was not to be had. Finally we saw a ridge that had potential. There was a spot that would work. Right now that spot was a 5 star. Only enough for our tent, but that was all we needed. We quickly set up the tent in the rain and safely cooked in the vestibule. Lesson learned today was to put on the rain gear early. By the time we made camp we had some pretty wet clothing. Sore knee and feet are going to make for an interesting hike tomorrow.